On April 16 and 17, CAIDA will host the 11th workshop on Active Internet Measurements (AIMS 2019) on the UC San Diego campus in La Jolla, CA. AIMS 2019 is by invitation only. We are imposing a limit on the number of registrants and will close the registration when we have reached capacity. Registration closed. We have received an overwhelming response of invited registrants interested in attending, but as seats are limited, we have reached capacity and are no longer accepting new registrations. All participants are expected to prepare a talk or presentation. Please submit an extended abstract related to one of the topics below with your registration, no later than March 8. We will evaluate the abstracts and notify the authors about acceptance by March 18. Accepted abstracts will be posted publicly on the workshop page. Where are things, at every level? New methods or new approaches to cross-leveraging existing methods. The workshop will run for 2 days this year (starting from Tuesday morning) with ample time for interactions between participants, breakout sessions, and collaborative discussions. 16:00 - 17:00 Discussion: what measurements should be sustained longitudinally for the next 3 years, as data products to share with the community? 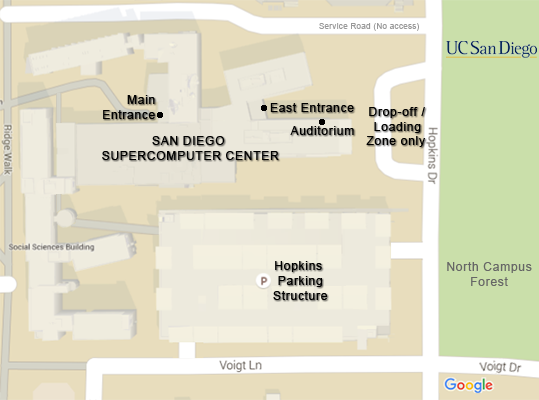 On arrival to campus on the morning of Day 1 from 8am-9am, temporarily park at the curb alongside the trees in front of the SDSC building on Hopkins Drive (see Drop off/Loading Zone). If there is a CAIDA staff member there, tell them that you are here for AIMS, and we will give you a special one-day parking permit, and then point you to the Hopkins Parking Structure for parking. If no one is there, park briefly and run into the Auditorium to get a permit first. Otherwise, parking permits are sold at the permit machines by the southwest elevators in the structure for $30/day. Parking legally is the attendee's responsibility. With a kiosk-purchased parking permit, you can park in any White " V ", Yellow " S " only, unless otherwise indicated. (New for 2019: purchased permits are no longer valid in green "B" spaces.) Please be sure to read the directions on the parking permit. Parking is limited, especially if arriving after 8am (if Hopkins is full, Pangea Parking Structure is the nearest parking alternative within walking distance to SDSC). The penalty for an improperly parked car is at least $65 per day. We cannot be held responsible for citations issued for parking in an incorrect space or improperly displaying your permit. For transportation concerns, general questions and help before the workshop, contact Julius Eshabarr at <julius at caida.org>.